This is the time of year when everyone is getting into baking Holiday cookies. I myself like to bake several kinds every year. Just because you are trying to eat healthier doesn’t mean that you can’t still enjoy delicious cookies! I make mine mostly gluten free and refined sugar free, and always use quality organic or natural ingredients. 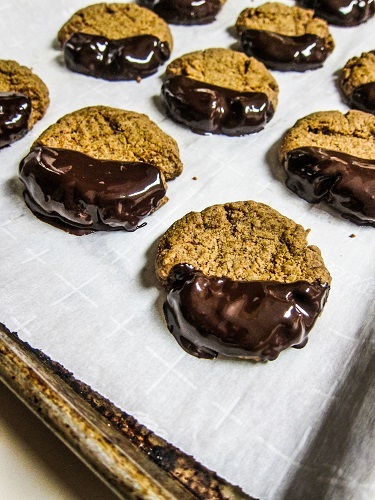 One of my favorites is these chocolate dipped almond butter cookies that I am sharing with you today. They are gluten free, vegan and use coconut sugar instead of the usual refined white sugar. Also, the chocolate I dip them in that can be found at Fresh and Natural Foods is sugar free as well! These are so delicious tasting that you will not even notice that they are not traditional Holiday cookies! Almost everyone makes cranberry sauce for Thanksgiving, but sometimes I like to switch it up and make something else with cranberries. Like this salsa recipe I am sharing with you today! 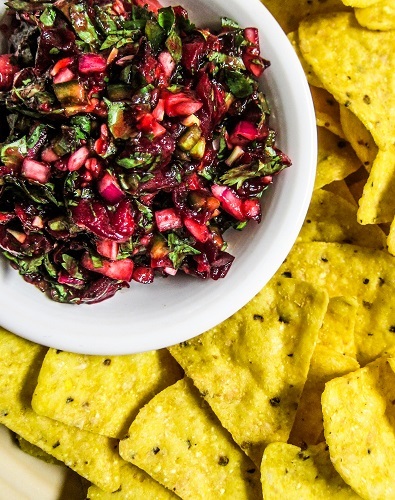 I love classic salsa, but fruit salsa can be delicious too! And why not use cranberries instead of the usual mangoes or pineapple. I like to use what is in season, and cranberries are widely available right now so they are perfect! They have a nice tart sweet flavor, and they actually pair really well with the savory elements of salsa. This is healthy and delicious, the perfect pre-Thanksgiving snack when paired with corn tortilla chips! 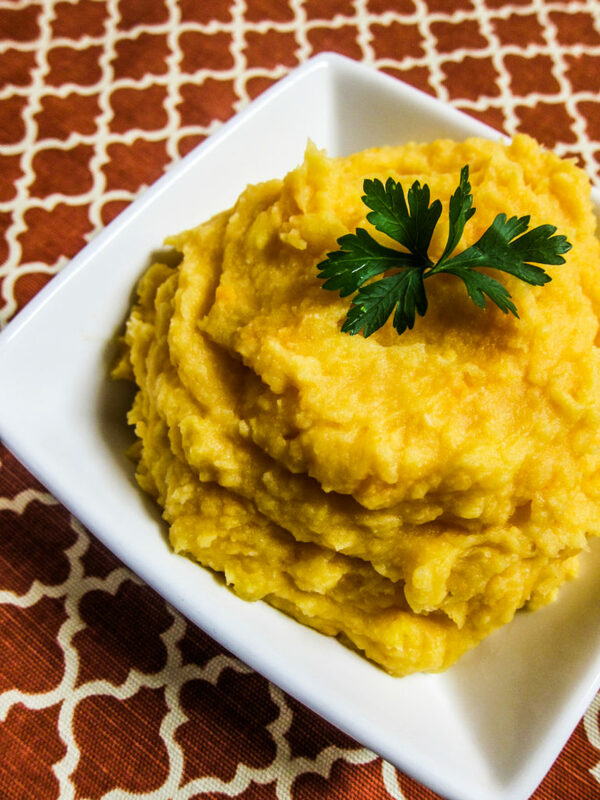 Mashed root vegetables are a great option for Thanksgiving in place of the usual potatoes. Not only are they delicious but they are packed with even more vitamins and fiber thanks to the variety of veggies included. I like a mixture of rutabaga, sweet potatoes or yams, and potatoes. It is a little sweet, but savory and pairs well with any sort of protein and gravy. This recipe is actually vegan because it uses coconut butter in place of butter, but you won’t even miss the dairy! This is the perfect dish to serve if you want something that tastes rich but is actually good for you! Wild rice stuffing makes the perfect gluten free option for Thanksgiving in place of bread stuffing! It is not only delicious, but a healthier option as well, since it packs protein and fiber. The recipe I am sharing with you today is pretty easy to make, and it is festive looking for the Holidays. 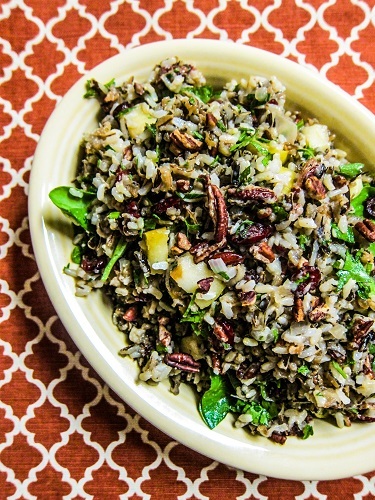 I include dried cranberries, sweet apples, and toasted pecans for a sweet and savory combination. This makes a perfect side dish served with a protein, or for a main dish, you can stuff it into a baked squash for a vegan main. Also, you can make this ahead and reheat it before serving, just add the arugula before you are going to serve so it isn’t too wilted looking. If you are looking for a vegan main dish to serve for Thanksgiving, a stuffed squash is always a good option! Not only does it look impressive, it is healthy and delicious as well! You could stuff it with apples, or grains, but the recipe I am sharing with you today has a super simple mushroom walnut stuffing that is substantial as well as really good. 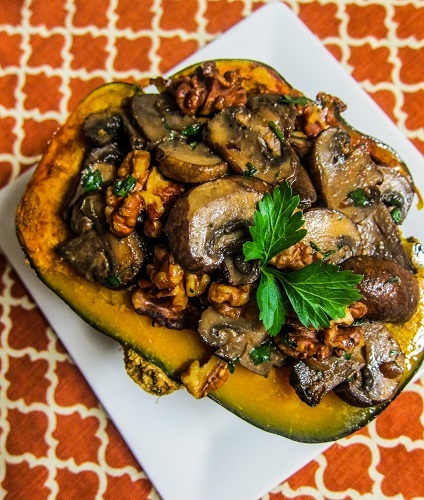 The mushrooms and walnuts provide a bit of protein, so this is a full meal if you want it to be, or you could cut the squash in half after making them if you wanted a smaller main dish to serve with other sides. 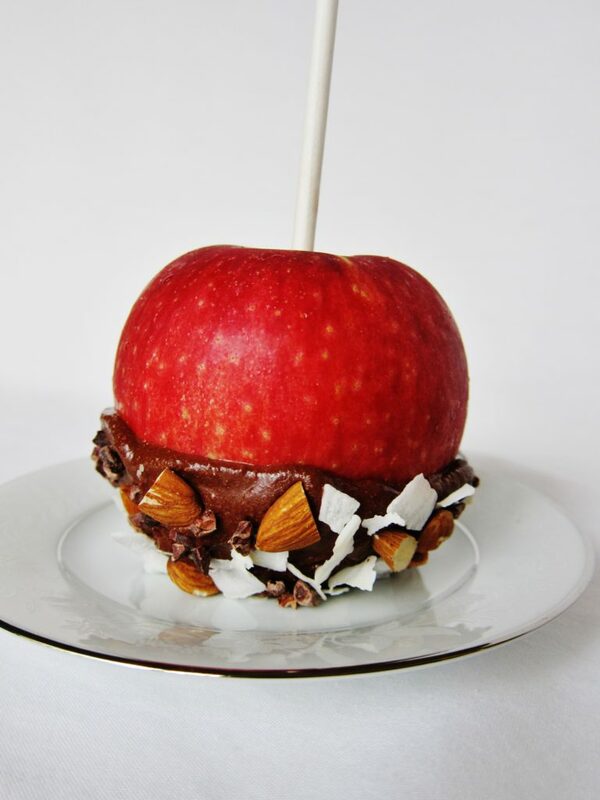 I love traditional caramel apples. But what I don’t love is all of the processed sugar that comes along with them. So, I make healthier ones at home instead of buying them! I make a caramel out of dates instead of sugar, which may sound odd, but trust me, it tastes just like caramel and is so much better for you! The recipe I am sharing with you today is for Almond Joy apples (like the classic candy bar, coconut, chocolate and almonds), so I made the caramel a chocolate caramel, then coated it with coconut, cacao nibs and almonds. If you are not a fan of those things though, you could leave the cacao powder out of the caramel and make it a vanilla caramel, then sprinkle it with the coatings of your choice! This is a healthier Halloween treat that you can make at home and not feel guilty about enjoying it! 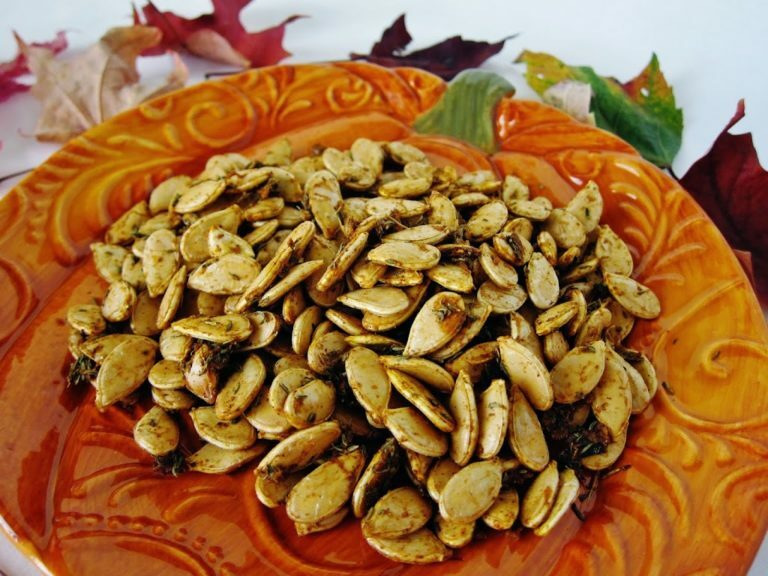 If you are looking for the perfect Fall snack to enjoy while watching a movie or football game, look no further! 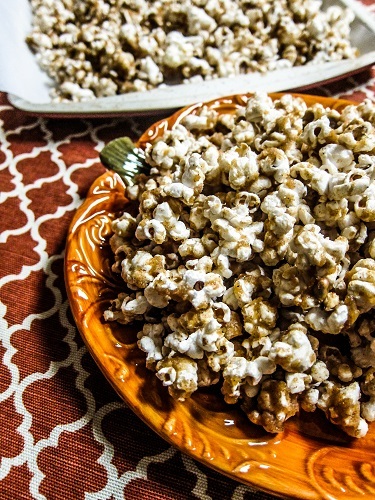 This Pumpkin Pie Spice Popcorn is perfect for that! I know you can buy this sort of thing but it is fun to make it at home, plus I like to make mine without refined sugar. This is super easy to make, and so good! It has all of the warming sweet flavors of pumpkin pie! 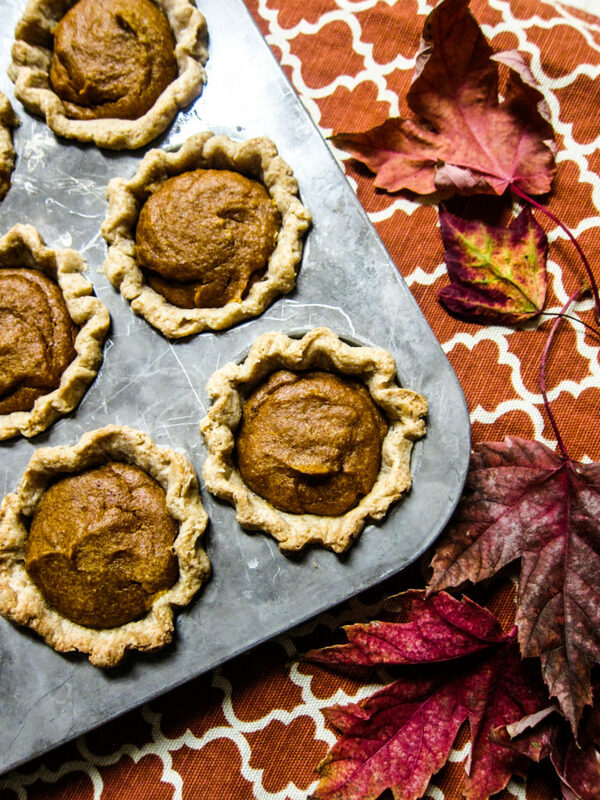 So put those pumpkin pie spices you only use a few times a year to good use and give this s try! The season for warming soups and comfort food is now here, and one of my favorite things to make is a creamy potato soup! The recipe I am sharing with you today is really simple to make, no slaving over a stove for a long time needed! 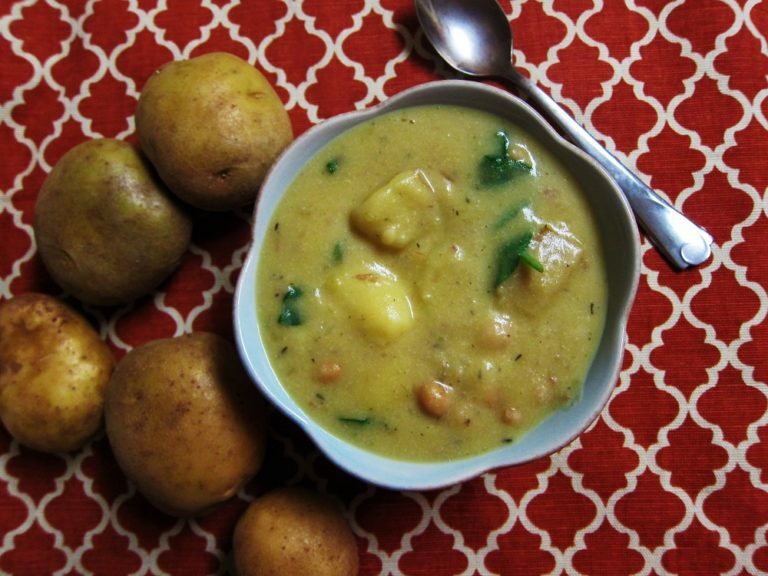 It gets its creamy consistency from partially blending the potatoes at the end, so you feel like you are getting a more rich soup than it actually is. This is actually very low fat, vegan and gluten free but you would never guess by tasting it! It is the perfect thing to enjoy on a chilly night. It keeps well too, and the flavor gets even better the next day, so if you have some left over it will be a good easy lunch or dinner.